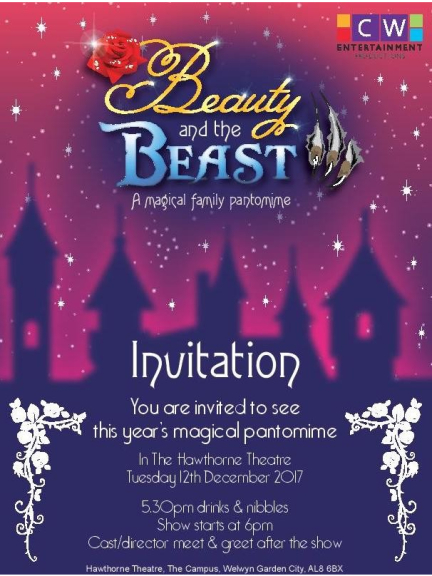 We'd like to announce our fabulous competition where one lucky child (and one accompanying adult) can join The Best Of Welwyn and Hatfield at the press night of this year's pantomime Beauty & the Beast at CWE WGC on Tuesday 12th December. The competition is open to junior school children currently in Years 3-6 who have an interest in writing and love a good panto! Just like and share the facebook post on our page and comment why you think you're the right person come along and write a review for us this year. We will select a winner on Friday 24th November. The winner will enjoy drinks and nibbles before the show at 5.30pm, then watch the panto at 6pm. After the panto there will be a meet and greet with the cast and director and some photo opportunities. This is a great prize for a local child, particularly one who loves panto and is a budding writer! You must be able to attend the press night on Tuesday 12th December at 5.30pm, panto starts at 6pm and there will be a meet and greet afterwards. The prize is for one child, currently in school years 3 to 6, with one accompanying adult. You will be also be accompanied on the night by Sarah from thebestof WelwynandHatfield. After the pantomine we would like the child to write a review of the pantomime which will be featured on our website and social media and also shared by CWE WGC. **Please ensure that the child entering is happy to do this and has a genuine interest in writing (and loves a pantomime). There may be photo opportunities and you consent to photographs of your child to be used on social media alongside their review of the pantomime. A winner will be selected by thebestof WelwynandHatfield on Friday 24th November and announced on our facebook page.